A collection of lolpauls, including ones that I did not make. Ill probably leave out ones that don't amuse me. Ron Paul sez .. plan ahead! lolpaul : I haz a newslettur! Ron Paul : keep human cloning safe & legal! lolpaul : Stealin' ur votez n cloggin' ur tubes! lolpaul : Thermometer iz COLD!1!! 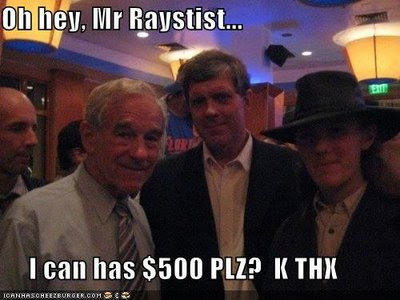 Ron Paul sez, "Gimme some, skin!" Can Bukkits be far behind?